Today is the last day of new releases week here at Mountain of Ink, so we'll finish up the week with Montblanc Miles Davis. Anderson Pens was very kind and sent a sample over for review. Miles Davis is a very pale, unsaturated blue. Seasonally, I think I would use this in the late winter or early spring. Other properties: Low shading, no sheen, no shimmer. On 20 pound copy paper, there was a little bit of feathering, but other than that the ink performed well. Ink swabs for comparison, left to right (top to bottom for mobile RSS): Organics Studio Wedding Bell Blue, Montblanc Miles Davis, and PenBBS 179 Serenity. Click here to see the Montblanc inks together. Miles Davis is much paler than Wedding Bell Blue and Serenity. Diamine Aqua Blue, Sailor Jentle Sky High, and Robert Oster Evening Sapphire. Click here to see the blue inks together. 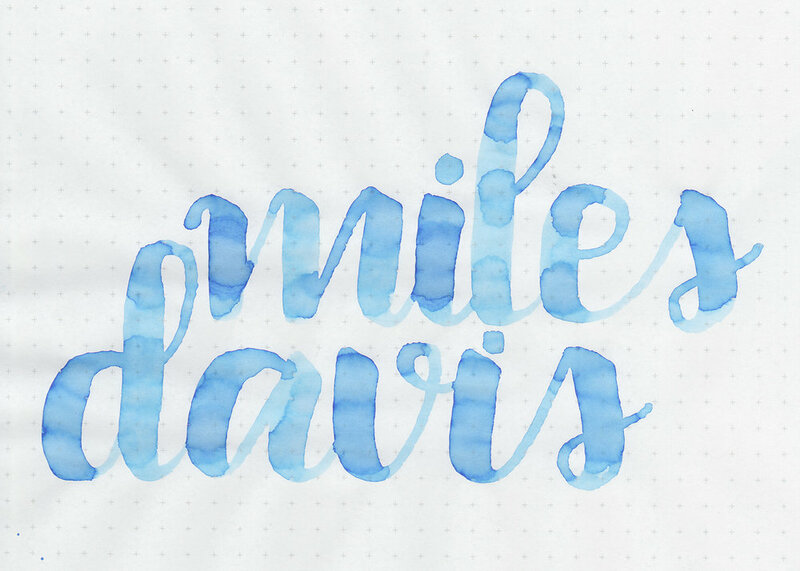 All three of these inks are brighter and darker than Miles Davis. I used a medium Pelikan M605 White Transparent on Tomoe River paper. The ink had an average flow, but it was so light and unsaturated that it was hard to read. Overall, the ink's color is a bit unique. It is very light, and as such is not one I think I would ever use. It's just too light to be easily read. I liked it best in the flex nib, where it looked the darkest. Give it a try, you might love it. Disclaimer: This ink was sent to me by Anderson Pens for the purpose of this review. All photos and opinions are my own. There are no affiliate links on this page.